The man was later identified as Richard Russell, a 28-year old Horizon Air ground service worker and a resident of Pierce County in Washington state. The FBI will not be pursuing federal charges. As part of the investigation, the FBI considered information from the National Transportation Safety Board’s review of the aircraft’s flight data recorder and cockpit voice recorder. Interviews with work colleagues, friends, and family and a review of text messages exchanged with Russell during the incident, did not identify any information that would suggest the theft of the aircraft was related to wider criminal activity or an act terrorism. 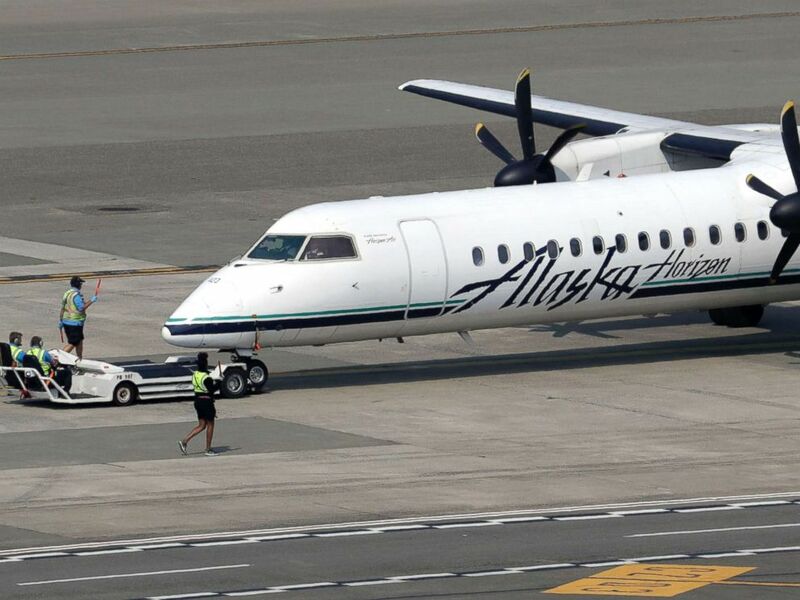 A Horizon Air Q400 turboprop airplane, part of Alaska Air Group, is moved into position by airport workers at Seattle-Tacoma International Airport in SeaTac, Wash., Aug. 13, 2018. Information obtained from the flight data recorder indicates that Russell maintained control of the aircraft, and the final descent to the ground appears to have been intentional, "if the pilot had wanted to avoid impact with the ground he had time and energy to pull the column back, raise the nose, and initiate a climb" according to a statement from the FBI, "instead, the column remained in a position forward of neutral and moved further forward about six seconds prior to the end of the FDR data." The Pierce County Medical Examiner’s Office identified the human remains found among aircraft materials from the crash site on Ketron Island as belonging to Russell, and lists the cause of death as multiple traumatic injuries due to airplane crash and the manner of death as suicide. The Transportation Security Administration said they take their responsibility to enforce security-related regulations and requirements to protect the nation's transportation systems "very seriously" and as such, conducted a civil investigation pertaining to the Horizon Air incident at Seattle-Tacoma International Airport in parallel to the FBI's criminal investigation.